Crime drama directed by Steve McQueen. When a heist turns deadly and leaves four men dead, their widows are left not only burdened by grief but of the debt their husbands had acquired in their criminal careers. With pressure mounting and threats being issued to the women to find a means to pay it back fast, Veronica (Viola Davis) decides enough is enough and recruits the wives to pull off a job of their own. 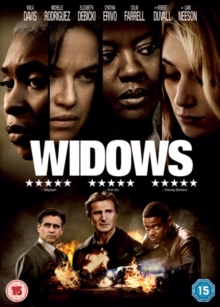 Veronica and the widows, Linda (Michelle Rodriguez), Alice (Elizabeth Debicki) and Belle (Cynthia Erivo) get armed and ready to make their own fortune using blueprints left behind by her husband, Harry (Liam Neeson). The cast also includes Colin Farrell, Robert Duvall and Daniel Kaluuya.